One of the most delightful short walks in Cowal is that from the church of Kilmorie in Strathlachlan, going along the shore to the remains of the old chapel of Kilbride. It should take you less than an hour in each direction. Start in the churchyard of Kilmorie, and have a look around there. Then walk south-west along the riverside path down towards the loch. If you are driving, park in the car park beside the river (you might still want to go and have a look at Kilmorie). From there a new and rather elegant wooden footbridge will take you across the Strathlachlan River. Continue along the shore on the boar-walk and the path. You will see the new Castle Lachlan on the right, across the fields. And then, bearing left where three paths meet, you will pass Old Castle Lachlan, the ancestral fortress of Clan Lachlan, on your left. It is covered in scaffolding at the moment as conservation work is taking place. Old Castle Lachlan is an ancient symbol of power on the shore of Loch Fyne. Keeping the old castle on your left, continue north along the shore of the loch. The path goes through a dense patch of rhododendrons, and is a bit wet and muddy underfoot sometimes. Go through an old metal gate and you find yourself on the shore of a little bay. At this point I find it easier to go onto slightly higher ground, up the hill to the right about 100 or 200 metres. This gets you above the clambering rocks on the shore, and above most of the advancing rhododendrons. 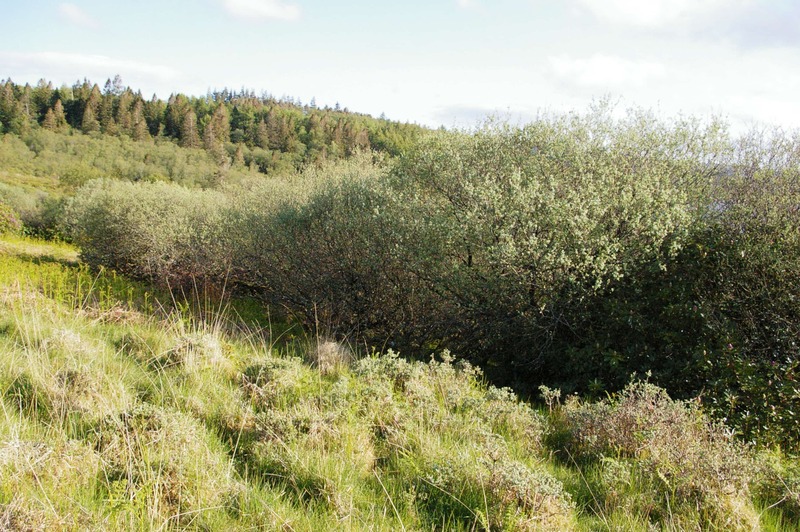 A stand of shrubby willow survives the encroachment of Rhododendron, and provides some shelter for sheep in harsh weather. Once at this height keep going north for about 500m, and you find yourself looking down on the site of the chapel. You can’t actually see much from up here, but you can see the remains of some old field walls and of a couple of old farm buildings. Go down towards them, and you will find the ruined chapel of Kilbride at the western (seaward) end of this area. It lies inside a large circular enclosure, somewhat overgrown by bracken. See the page on Kilbride Chapel for further details and a plan. Local archaeologist Betty Rennie thought that the big circular enclosure with its thick walls may have pre-dated the chapel. Might it have been a caiseal, the fortified enclosure of an Iron Age settlement, later adapted as the vallum of an early medieval chapel? 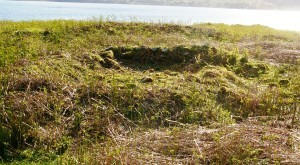 There used to be a ferry operating across Loch Fyne from here – this is the narrowest point in the loch. The ferryman used the sheltered water behind Kilbride Island, just below, as the harbour, and crossed over to Crarae – a distance of only 1.7km. It may be that the village and chapel which stood here for centuries grew up here partly because there was a long-standing ferry. Perhaps the caiseal itself, if that’s what it was, was built to control the ferry-crossing. To return to where you started, you could go back the way your came; or you might prefer to head east, up and over Barr an Longairt (Gaelic Barr an Longphuirt ‘hill of the summer pasture or shieling’), past Tobar an Longairt (‘well of the shieling’, with its removable stone lid)which supplied the old village with water, and eastwards over Creag Bhreac (‘speckled/variegated rocky hill’). After about 1k you will find yourself on the quiet road. Turn right and return to Kilmorie and Castle Lachlan carpark.